Going on a social media purge as your penitensya (penance) or beach bumming in places like Boracay or Palawan for the Semana Santa is well and good, but don’t you ever get tired of the same trend every single year? Why not go on a simple summer holiday where you can enjoy your vacation AND still experience something relevant to Holy Week festivities? We have rounded up ideas for your Semana Santa escape. Iloilo isn’t the first place that pops into people’s heads when it comes to answering the question “Where should I be this Holy Week?” It’s not as popular a destination especially that crowd favorite Boracay is merely on the northwest part of the island. But the sleep town of Barotac Viejo may just give you something new. The little town is known for having a community that is takes their Holy Week seriously by mimicking the Passion of Christ. The townspeople themselves have been performing the Passion play, with “passion” Hiligaynon every Good Friday for almost half a century in their annual Taltal sa Barotac Viejoand it’s a delight to watch. It’s an island north of the Cebu mainland that’s become popular for its stretches of fine-sand beaches that is expected to see an influx of tourists this Holy Week. What people shouldn’t miss while in the island paradise is the annual Pasko sa Kasakit, a simple celebration of the stations of the cross, but with a twist where the images in the Station of the Cross are supersized and paraded around. This island is starting to blow up more for the views you’ll get than what happens here during Semana Santa. Siquijor, known across the country as a home to witchcraft and mysticism, but locals have since shed that image and now proudly celebrate their folk healing expertise with the annual Folk Healing Festival, taking place during the last few days of Holy Week. Get yourself treated by local healers or witness how they make various concoctions with the promise of curing almost anything you can think of—yes, including heartaches. If there’s a Holy Week destination that’s never left off any list, it’s Marinduque. 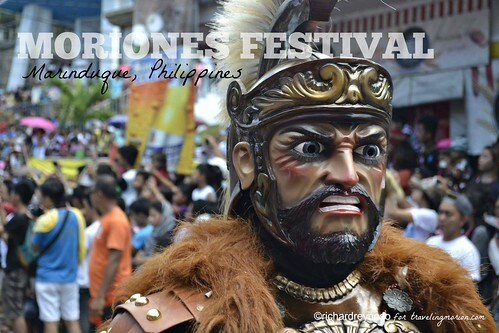 Known as the geographical heart of the Philippines, it’s basically an island that’s made itself known for a festival that celebrates a Roman soldier who became a believer in Jesus Christ: the Moriones Festival. He’s not really angry, but he is the first thing you’ll see when you look up information on the Moriones Festival, the tale of a Roman soldier who became a believer in Jesus Christ. Photo by Richard Reynoso for travelingmorion.com. Most of you will know what this festival centers on commemorating Roman soldier Longinus, who stabs Jesus on the side, witnesses His resurrection, tells the Romans about it, and (gruesomely) gets his head chopped off. This part is often depicted in their version of The Passion play, which talks about Christ’s last moments before He eventually passes on. It’s the piece de resistance of a list of Holy Week destinations, and something that’s also been a source of controversy as to whether or not it should be considered a tourist attraction. We’re talking, of course, about the Maleldo Festival in San Pedro Cutud, Pampanga. Yes. This is a very REAL crucifixion. In San Pedro Cutud. And it happens nearly every year. Photo by istolethetv on Flickr. 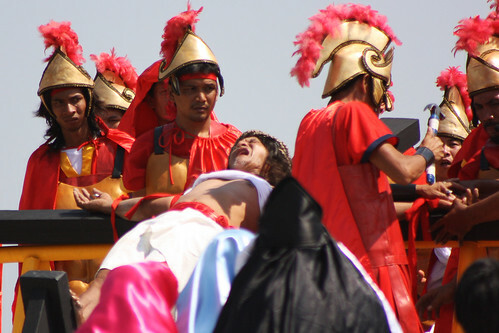 The Maleldo Festival is the full (and very real) re-enactment of Christ’s crucifixion. Yes, it’s the whole 10 miles: the garb, the Crown of Thorns, crying depiction of Mary Magdalene, people marching on the streets whacking their backs with things that make them bleed, and someone actually getting nailed to a cross that they’ve been carrying for several miles. Yes, you read that right. It’s an option for those who don’t want to go out of the city yet still want to witness something that only happens once a year. The citizens of Makati, particularly those who live in the restaurant-and-bar hub that is Poblacion, stage a parade commemorating Lent. They hold a grand procession every Holy Wednesday (closed roads, of course) and put up booths with life-size depictions of The Passion of Christ. Another plus: some establishments stay open even during Holy Week! It’s 2019, and we’ve got a bit of juicy travel bits for year straight from people who have been in the travel industry for several decades—the Philippine Travel Agencies Association (PTAA)—that might just surprise you. Or for most people, it will be. PTAA president Marlene Dado Jante sees more people embracing travel as a way of life rather than a luxury, thanks in large part to how affordable trips are becoming and how accessible information have become. DIY trips are also becoming more and more popular, with blogs, vlogs, and books (e and tangible) that let you do your trip your way. Couple that with hostels and Airbnbs and you have a recipe that supports traveling as a way of life. Vlogs, in particular, are perfect sources of itineraries, travel budgets, and travel hacks that equip anyone to travel. A simple search on YouTube and you’ll find budget itineraries complete with the actual experience you’ll get from people like Christian LeBlanc (Lost LeBlanc), Patrice Averilla (Avelovinit), and a lot more. Rehab is apparently a new buzzword for the local tourism industry. It’s only been months since the island of Boracay was opened. El Nido is already being worked on, and everyone from your mother to that nosy neighbor you sometimes talk to is talking about how clean the shoreline of Manila Bay has become. Camping is, well, camping. You get a sleeping bag or a tent, bring your own food, and find a place to sleep. It’s very sustainable albeit tough because you need to find a place where it’s okay to do that. Glamping, on the other hand, is camping leveled up. It’s like staying in a hotel, but you’re in a tent. You’re outside and “exposed to the elements” but with all the creature comforts: a comfy bed, cooked food, “indoor” plumbing, and the like. Crystal Beach in Zambales offers camping and glamping; Pass Island in Coron offers camping; Tagaytay has a number of hotels offering glamping. There’s one type of tourism that’s been popping up since 2016, yet no one seems to be taking a hint: farm tourism. It’s young, but it’s not that difficult to understand. What you do is you visit a farm, you learn what it’s about, what the farmers do, and what-not. It’s a great way of promoting what has sustained our country prior to the many wars—a way for us to go back to our roots. The souvenirs at the end aren’t half bad, and they let you buy their goods at affordable prices. Check out FarmPlate if you’re planning for a farm tour. For info, click here. The Philippines is predominantly Catholic ergo its handful of centuries-old churches, basilicas, and cathedrals that have stood the test of time both in the big city and distant islands. This fact brings about tons of people poking interest in the Philippines as a pilgrimage site. So, it shouldn’t come as a surprise that travel agencies often include trips to churches.